Alicia's Keys, Virtual Acoustic Piano from Native Instruments. 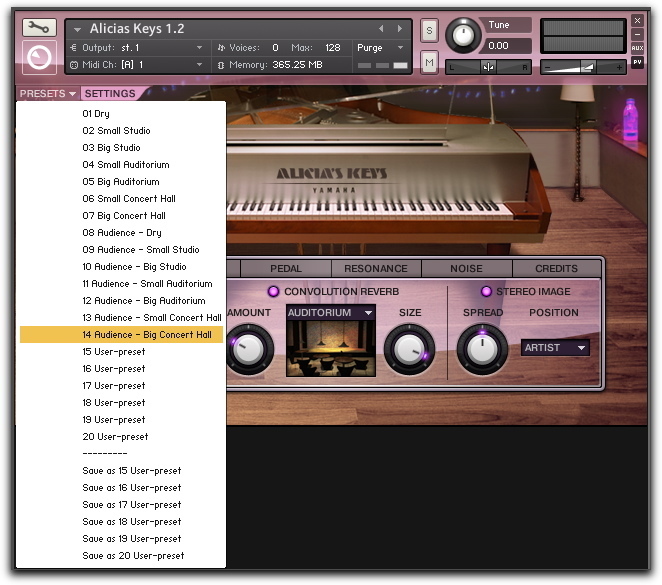 Following our review series on virtual pianos, we test the results of a triple collaboration between a manufacturer (Native Instruments), another manufacturer (Scarbee) and an artist (Alicia Keys). 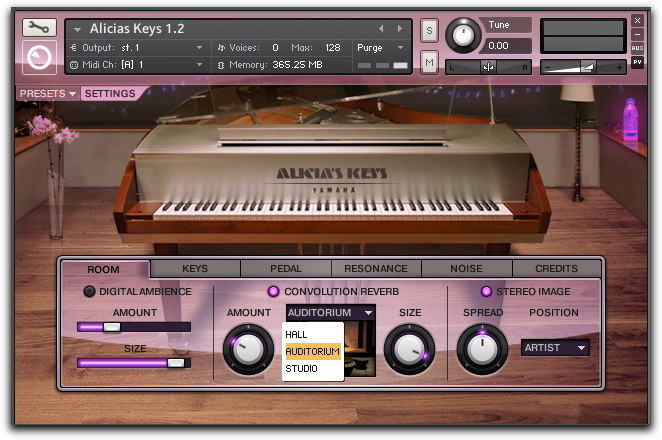 The instrument is a sample library for Kontakt 4 and/or the Kontakt 4 Player (good news), and includes about 3,000 samples compressed with a proprietary codec (6.9 GB of samples equivalent to 17 GB uncompressed). The drop-down menu gives you access to the ambiance presets in which you'll find more or less standard possibilities like studio, auditorium and hall with different dimensions. An interesting feature allows you to select spaces not only from the musician's point of view, but also from the audience's — something quite rare. So it's not the usual "R highs - musician / L highs - audience" option but a different "submersion" into the overall sound of the instrument AND the environment that surrounds it. Below you can listen to two samples that show both options of the same preset, first from the musician's standpoint and then from audience's. You will need to try different things depending on the style or sound you wish to achieve. However, the settings won't solve the main (or only?) 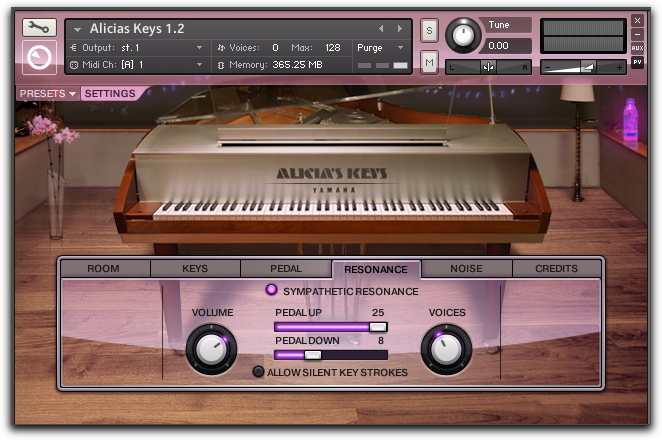 disadvantage of Alicia's Keys, which is that the resonances on the lows are too present. We should also state that they have improved since version 1. In the following sound sample, you'll hear this very particular, and rather embarrassing behavior over different velocity levels, first in version 1, then in version 1.2. The Half Pedaling feature is a nice surprise. It simulates "half pedaling" (or tremolo) using a technology based on impulse responses (IR, we could not find out more about this technology). 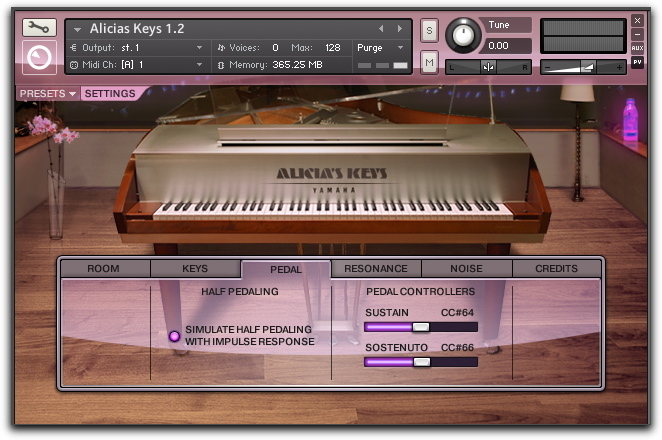 You must have a sustain pedal capable of sending continuous controller values. 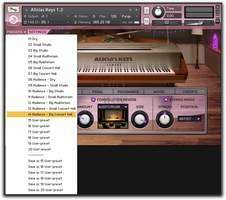 If you don't, a volume footcontroller will also work by changing its CC number in your DAW or assigning it to Kontakt using the dedicated slider. Here is an example of the result. However, I recommend you to use it carefully to avoid sudden unrealistic sustain behavior, i.e. when you press the pedal after having held a chord. This issue doesn't occur when you use the sustain pedal without Half Pedaling. It is one of the limitations of simulation via IR instead of modeling. 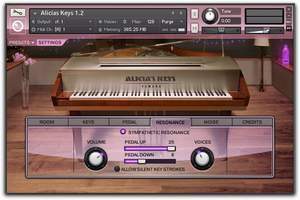 In the following sample you can hear the resonance of staccato notes (no sustain at all) while an A9 minor chord (A1, A2, E3, G3, B3) is played silently and held over the full sample. In this sample, you'll hear first the phrase without resonance, then the phrase with resonance (Voices setting @ 200). Finally, here you have three samples used for the Ivory II and Tonehammer Pianos reviews as a comparison. 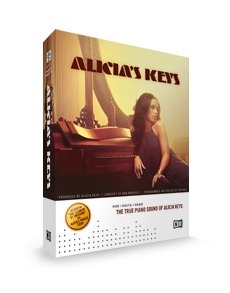 Do take into account that they were played with the response of those pianos and would have been played differently if they had been played with Alicia's keys (each instrument has its own response). 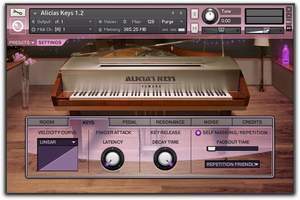 While Ivory II can claim answering all possible needs for jazz and classical music, and the Tonehammer pianos seem to be the perfect tool for soundtracks, Alicia's Keys can be considered the ideal piano for pop and rock (as well as some jazz and fusion styles): it sounds dynamic and clear, and has a quite authentic personality and a very particular attack. Lots of pros, starting with the high-quality sound thanks to perfect recording (but not lifeless or clinical) with a nice roundness after a very present attack. 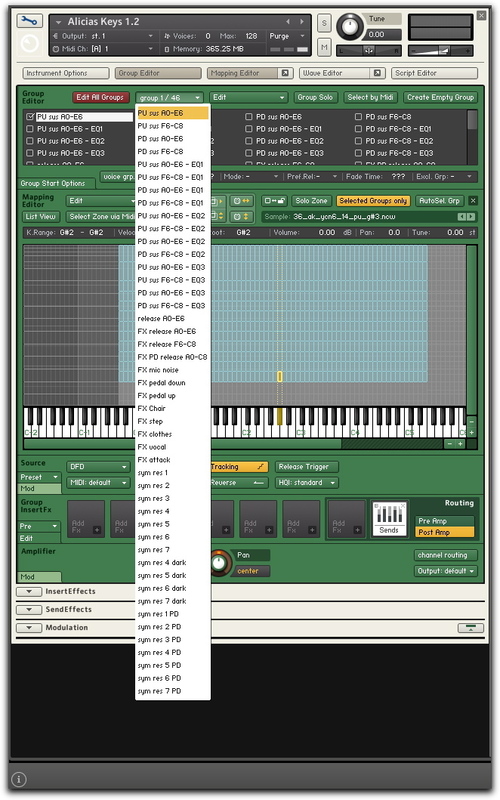 The different half pedaling and resonance scripts, the adjustable noise (nice, wooden mechanical noise) and the IR amount to everything we expect from a modern virtual piano. The CPU load is reasonable, as well as the price. As for the cons, we noticed some metallic resonances that can become very annoying with percussive playing. And especially the low octaves with their rather bothersome resonance. You must also be aware of the half pedaling simulation, unless you have nothing against unwanted sustain. Finally, an almost inaudible noise uselessly increases the duration and the number of active voices, which affects CPU load. 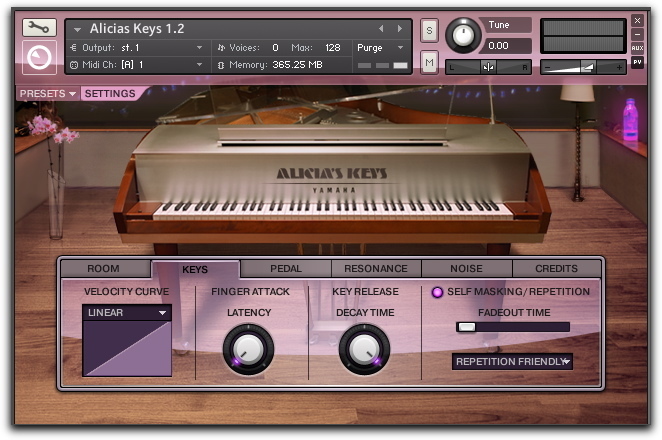 Looking at what other manufacturers have to offer, you won't be able to find a versatile piano that can handle any situation... and Alicia's Keys doesn't claim that either. And is it really that bad? We ought to be happy, even at the expense of our budget, to have so many options available that provide so many different sound colors to our songs! Hardly usable in other music genres than pop, rock, etc.